There’s a middle ground on which some shows try to balance. On one side is a show which explains everything to the audience, spelling out the plot, characters and background so that nothing is left to the imagination. On the other side however are shows that are entirely vague on everything, leaving everything to the audience to extrapolate, or indeed make up for themselves. There’s a patch of territory in the middle however where the audience is forced to think and interpret, but the writer has given enough hints that they end up exactly where they were meant to be, coming to the same conclusions and having those predictions confirmed. 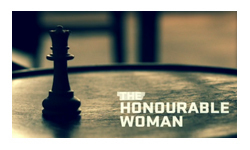 The Honourable Woman tries to find that balance point, an admirable ambition but I’m not entirely certain that it was successful. There were certainly points during the season where I had no idea what was going on. Reading The Guardian’s recaps was as much a part of the show as actually watching it, and that would frequently point things out to me which had completely passed me by. At the same time thought, episodes would make a big ‘reveal’ things that I’d been assuming as a given for a while. Discussing the show with friends the next day became a regular habit (which is great!) and they tended to agree with me that they missed some things and assumed others (which is not so great), although it wasn’t always about the same things (which is just confusing). Despite that the show was certainly watchable, even compelling. Each episode moved things along and the rate at which questions were answered and new ones introduced was very satisfying. There were a few too many incidents of smart characters having to act dumb to move the plot along (“this isn’t a stone factory”) or being passive when they should have stood up for themselves more (“I deserve it”), but that may be just my own disappointment in the characters themselves, not that those actions were ‘incorrect’. The style of the show also occasionally lost the balance, falling too far on the arty side of the spectrum, which always makes me lose focus. Some of the scenes had absolutely stunning lighting and framing but others (and the credit sequence) seemed to be trying too hard to make the show feel moody and atmospheric, which to me conflicted with the more practical nature of the story. I also thought the music montage of real news clips in the last episode was a huge miss-step, we shouldn’t (and didn’t) need to be told after that many episodes that there’s such suffering in the Middle East, it cheapened the whole series by making it feel like a slow build up to a charity appeal. What held the show together though were the performances. I thought it would be impossible to find a challenger to Sarah Lancashire’s performance in Happy Valley, but Maggie Gyllenhaal gives it a fine attempt. As Nessa Stein she demonstrates another amazing balance act between a strong and confident baroness, and a terrified and isolated woman with secrets; hiding behind rigid control in public and struggling to not break down in private. Gyllenhaal used everything from her voice to her eyes to deliver this stunningly complex character. I have to admit that I did lose track of the plot towards the end, at least partly due to my embarrassing lack of understanding of the whole situation in Israel and Palestine. The personal stories all made perfect sense, what the characters did and why, but the larger motivations of the regimes involved rather went over my head (or another way of looking at it, weren’t adequately explained). That did leave me feeling a bit down on the show at the end, but none of that changed how completely engaged I was in the show. It was not a flawless series, but it was an ambitious idea and a very worthy and watchable attempt.